The winner of VPN of the Year in 2014, 2015, 2016, 2017, and 2018. NordVPN is undoubtedly the worlds greatest VPN service and has remained so for the past 5 years. We honestly don’t expect this to change anytime soon as they continue to dominate in every major category crucial for a Top-Tier VPN providers including: Security, Speed, Features, Pricing, Ease of Use, Customer Support, Reliability, and Payment options including Bitcoin. 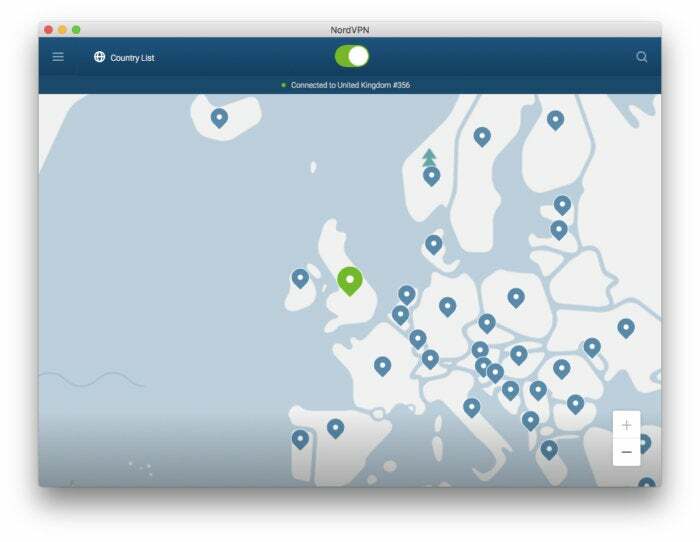 NordVPN: What’s new in 2019? NordVPN has further improved their speed and overall performance which we though would be near impossible as they were already blazing fast and miles ahead of every other provide in the world. I am also pleased to note that US Netflix still works fine and this is obviously a major draw for many people. What has really impressed me is their price reduction. They were already one of the best value providers around, and now they offer even better value for money which is just incredible. NordVPN has a number of specialized servers that VPN power users will want to take note of. The first are the P2P servers, which allow file-sharing traffic. NordVPN has an interesting feature where if you start running a file-sharing program on a non-P2P server it will automatically shift you to a dedicated P2P option. 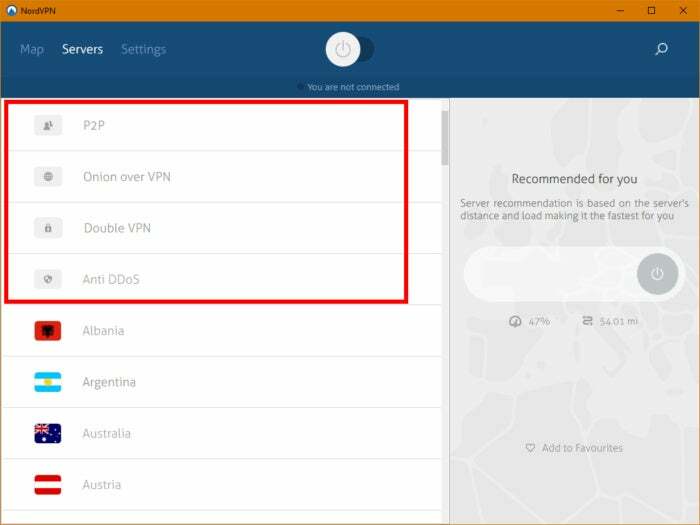 NordVPN also provides three dedicated TOR servers for those who want to combine the anonymity of the TOR network with the VPN. The nice thing about this feature is that you don’t have to be using the dedicated TOR browser. NordVPN takes care of all the configuration and routing for you. Once you connect to one of the service’s Onion over VPN servers, you are on the TOR network. NordVPN offers a number of specialized servers including P2P, Double VPN, and Anti DDoS. For users in countries where connecting to a VPN is not allowed or generally blocked, NordVPN offers obfuscated servers that make it easier to connect to its service. This feature also adds servers in Egypt and the United Arab Emirates that brings NordVPN’s country count up to 60. Finally, there are dedicated IP servers where you can purchase an IP address that only you use. Static IPs are available in the U.S., Germany, UK, and the Netherlands. One final new feature is the addition of a built-in ad blocker and server-level antivirus called CyberSec. NordVPN allows six devices to connect simultaneously from a single account. It offers applications for Windows, Mac, Android, and iOS, and proxy extensions for Chrome and Firefox. It also has tutorials on how to use NordVPN on routers, Linux, Raspberry Pi, and Chrome OS. Anyone with a good reason to be paranoid will be happy to know that the company offers a number of connections that employ double encryption. That option pushes your data through two servers instead of one, ensuring that the information you access will be sent/received—albeit very slowly—in the most secure manner possible. The company also offers a few security extras, such as a software kill-switch baked into its desktop app to stop all web traffic if your computer is disconnected from a VPN, ad-blocking functionality, and automatic blacklisting of webpages with questionable security practices or that pose a phishing threat. NordVPN has over 2,863 servers in 59 countries. As mentioned earlier, NordVPN’s overall average speed has increased dramatically since we last looked at the VPN. We tested every country and all came back with more than acceptable speeds for 1080p video streaming and other demanding tasks. Overall NordVPN is faultless in this category. NordVPN has figured out how to consistently get around Netflix’s VPN filters (something that no pother provider can do). The company has dedicated support pages explaining how to watch Netflix and Hulu on NordVPN servers. Netflix is accessible from any U.S. server on NordVPN. Torrenting is safe and extremely fast. NordVPN has made special “P2P servers” that are solely meant for keeping your torrenting activities safe and private. You can access the P2P servers via “specialty” servers list on their application. NordVPN only asks for an email address and password when you create an account. Payment methods can be via credit card, PayPal, or Bitcoin meaning you can get about as anonymous as realistically possible short of paying with cash. The company is based in Panama, and has a business address of 50th Street Global Plaza Tower, Panama City, Panama. However, the company doesn’t list any of its team members on the company site. “Being a security firm, for privacy reasons we do not disclose identities of our staff nor management,” a company representative said via email. A Google Street View image of the office building where NordVPN is located. And while the best VPNs managed to achieve download speeds of 60 Mbps+ and up, NordVPN came out with 74.15 Mbps. Overall, NordVPN is without a doubt the worlds fastest VPN by a mile compared to every other VPN. If you want speed, NordVPN should be your first choice. NordVPN can be contacted by support@nordvpn.com or through live chat. Even after reviewing over three dozen different VPN providers, hundreds of hours of testing, examining and reviewing, we still have questions or need for technical assistance. Whether it’s to double check the encryption offered for your router, or a simple troubleshoot on a newly built rig, you will be forced to deal with the customer support of your VPN of choice. If you’re a newcomer or not technically inclined? You might have some technical questions. Any VPN worth their salt will have a prolific database of tutorials, how-to guides and informational articles in addition to live chat & quick email support. NordVPN has a very fluid, well designed and detailed website. Their set-up instructions are very easy to follow, they have plenty of documentation to help beginners and techies alike and they are up to date with their social networking. They also have a number of free tools available that we discuss later on. NordVPN accepts payment via credit/debit card, or PayPal. It also accepts Bitcoin, which allows for potentially anonymous payment. Additional payment methods are available through NordVPN’s payment partner, Paymentwall. NordVPN is the worlds best performing VPN with a great user interface, an excellent amount of respect for privacy and anonymity, and the advantage of accessing U.S. Netflix overseas. If you’re looking for ultimate privacy and security, unmatched performance, and amazing value for money, NordVPN should be you first choice.